These are some of the best keyboard shortcuts to increase your productivity. These Windows keyboard tricks will save hours of work every year thanks to these hidden Windows functions that you probably did not know about. Shall we start? All operating systems for computers support different keyboard shortcuts, from Windows to macOS, through Linux. Some of these key combinations are well known to everyone, such as copying with Control + C in Windows or making a screenshot in macOS, but not all are so popular. 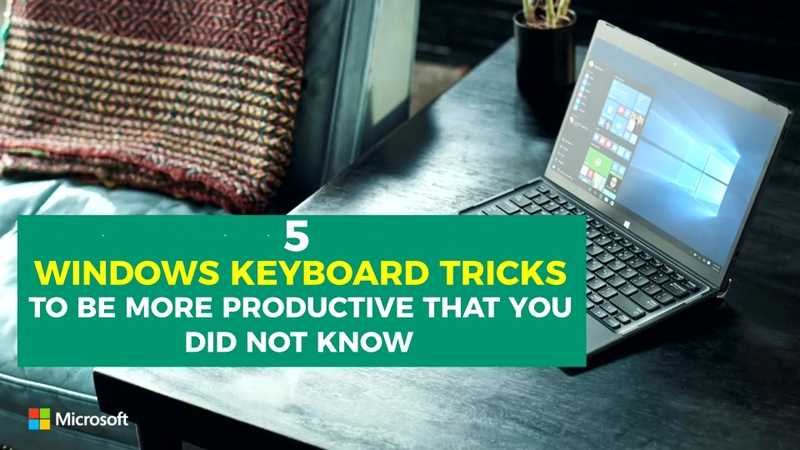 Some of the best tricks for your Windows keyboard that was completely unknown to you, although thanks to them you can save a lot of time each day. There are actions that you can practically perform in a matter of seconds instead of navigating through the system menus. We will explain all the keyboard shortcuts here. You may have so many windows and applications active at the same time that you no longer see the desktop or know what you are working on. In that case, press the Windows + M key and you will see your screen clean of dust and straw, without programs or open windows. Not everyone has the same view, that’s why among the so-called Windows Accessibility Options there is a call Magnifier. With this tool, you can use the mouse cursor as a magnifying glass and enlarge any part of your screen. You just have to press Windows and + at the same time. It is one of the best keyboard shortcuts for Windows if you do not see well up close. What is the high contrast mode for? If even with the magnifying glass you can not see the objects on the screen, especially the text, you can make the white black or something like that by pressing Shift, Alt and the Print Screen key. There is a Windows trick that can be very useful or a practical joke. It depends on if you do it and also if you know how to return the computer to its original state. It is the combination of keys that rotate the orientation of the screen. That is Control + Alt + one of the arrows. Instantly you will see the screen turn to the side of the arrow you have pressed. You may have to run away from home but do not want to lose the job you were doing. The easiest thing is to save and shutdown. But what if there is a hidden function on your Windows keyboard to close the assignment by keeping everything you were doing? It is a keyboard shortcut of the most useful and simple. Press the Windows and L keys at the same time to suspend all the activity and leave it “frozen” till you return. These are the five all-time best Windows keyboard shortcuts which help us to save time. I hope this article will help you to use your time productively with your Windows Keyboard. If you have any queries regarding any of the shortcuts, let us know them in the below comment section and we will get back to you as soon as possible to solve all your queries. Would you like to add any other important and productive Windows keyboard shortcuts to this article? Then write them to us and we will include them in this article in the next update. Which windows keyboard shortcuts helps you to use your time more productively?